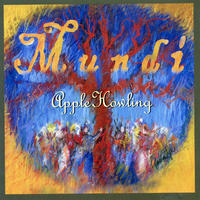 Mundi: Early music meets global folk at the penguin café. 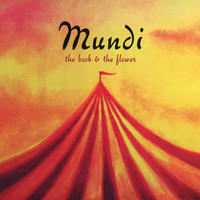 Mundi displays a healthy disregard for where the boundaries of folk, classical and rock lie. With strings, Spanish guitar, French horn and an arsenal of percussion, this dynamic sextet from Austin, Texas creates a sound that's rich, celebratory and deeply emotive. The ensemble, led by composer Darrel Mayers, has toured Spain three times, appearing once at the Granada International Festival of Music and Dance. They have also collaborated with poets Robert Bly and Coleman Barks, and the Grammy award-winning choral director Craig Hella Johnson of Conspirare. The band's favorite description of its sound? "Early music meets global folk at the Penguin Café." Darrel Mayers (director, guitar) grew up in England's Southeast and graduated from tin-can drum kits to Spanish guitar as an 11-year old. He toured France and Spain with a school music group when he was 12, and has carried on playing ever since. A musical highlight was to perform with Mundi at the Granada Fesival of Music and Dance. Others include performing with poets Coleman Barks, Naomi Shihab Nye, and with Conspirare director Craig Hella Johnson. Favorite artists include the Penguin Café Orchestra, Freelance Whales, Steve Reich, Baltimore Consort, and Pink Floyd. Margaret Ayer (French horn, harmonium) grew up in Denton, Texas, and began playing horn as an 11-year-old. A highlight of her career was playing in the Austin Symphony next her teacher, Wayne Barrington, while a student at the University of Texas. Out of college Margaret moved to Mexico City, and played with the Mexico City Philharmonic for 7 years. Margaret has played with the Houston Ballet orchestra for 20 years and has performed on the soundtrack for 'Spy Kids,' and appears on recordings by Sarah Hickman, Lee Barber and Eric Johnson. Tony Rogers (cello) from Dallas, Texas began playing at age 10. "Cello, because the music teacher ran out of violins, then violas... But I knew I loved the cello far more than the violin very early on." Tony describes himself as "currently building my highlight reel for my musical career." 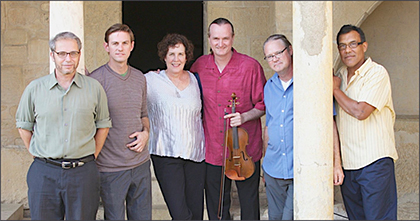 Along with Mundi, Tony performs with Jenifer Jackson, the Austin Piazzolla Quintet, the Waterloo Trio, Quiet Company, Strings Attached, and has performed on the nationally radio show Mountain Stage. Tony has also composed music for several films and documentaries, including most recently "Wild Horse, Wild Ride." Current musical heroes: Chris Thile, Aviahai Cohen (bass), and Thom Yorke (Radiohead). Mario González (upright bass) is from San Antonio, and first picked up a bass guitar when he was 24-year-old. Mario is a retired fire-fighter, and says the highlights of his career include 'playing music with so many great musicians, and traveling and performing in Spain.' Mario has played with poet Coleman Barks, Craig Hella Johnson, and Spanish guitarist Ignacio Casatejada, and is currently performing with Topsy, Seno, and the Trulies. Ric Furley (percussion) grew up in Corpus Christi, Texas. He began his musical career with piano at 9, and shifted to drums as an 11-year-old. Career highlights include performing with the Electric Light Orchestra, playing at President Obama's inaugural parade, and touring Spain with Mundi in 2006 and 2008. Ric has performed with David Amram, Dudley Moore, Bob McGrath, Junior Brown, Coleman Barks and Robert Bly. Favorite artists include Milt Jackson Lional Hampton, Richard Thompson, Berlin Symphony Orchestra, Tom Waits and the Electric Light Orchestra. You can find out more about Mundi on their 크레이지슬롯 사이트website. 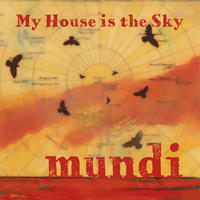 Mundi lives in Texas, USA. Tagged as: World, Folk-Rock, Folk, Medieval, Instrumental, Acoustic Guitar, Cello, Electric Guitar, Violin, World Influenced.